Wansdyke at Milk Hill is better developed than at Tan Hill, is better accessible and has more or less the same views to the north. Here, Wansdyke encounters the Ridgeway and leaves the High Downs for the wooded lower land. Though the crossing point between the modern road and Wansdyke borders on the privately owned estate of Shaw House, the parts to the west can be accessed. There is of course the Wansdyke Path across the eartwork itself, but also very good footpaths from the parking in the valley between Knapp Hill and Adam's Grave. By car from Swindon. Follow the A 346 to Marlborough, then the A 4 to Avebury. At Fyfield, take the minor road left to Lockeridge and Alton Barnes. After passing a wood to your left, you'll cross Wansdyke at Shaw House, but the bank is completely overgrown and not much'll be visible. Continue on, and best park the car at a little parking just before the crest and the descent to Alton Barnes. (Warning, it may be closed!) The top to your right is Adam's Grave long barrow. 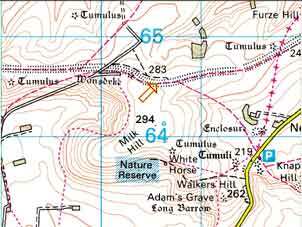 A public footpath (1 km), known as 'The Workway Drove', will lead you to Milk Hill. Alternatively, another public footpath (1 km), the Ridgeway, will lead you to Red Shore. Alternatively, a public footpath from South Lodge (the Wansdyke Path) leads across Wansdyke to Milk Hill. Alternatively, if you don't mind a good walk, take the A 342 to Pewsey, and the road left to Etchilhampton and All Cannings. When you've passed the village and crossed the Kenneth & Avon canal, stop at the crossing of Cannings Cross, where there is ample parking space and a public footpath leads through the combe between Tan Hill and Milk Hill, all the way (3.5 kms) to Milk Hill. click here to return to East Wansdyke, section 9.